Photo Credit: rickz via Compfight CC-BY-NCD-ND. This year marks the centennial of the National Park Service, and record numbers of visitors are expected to celebrate by exploring the system’s incomparable natural, historical, and cultural resources. All those adventure seekers impact parks. But there’s a respectful way to go about it. When a tourist loaded a young bison into the back of his car at Yellowstone National Park last month, the incident shocked people inside and outside the park. But there are ways all visitors—park veterans or nature newbies—can minimize effects on these irreplaceable places and set parks on a sustainable path for the next century. You can help keep the wild in wilderness and maybe even leave parks better than you found them. Since the bison calf incident on May 9, Yellowstone National Park officials are on high alert. The driver, Shamash Kassam, of Canada, was cited for “picking up and disturbing a bison calf” when he encountered what he said was a “wet and shivering” calf in Lamar Valley. Concerned for its survival, he said, he plucked the bison from the roadway, placed it into the back of his SUV, and drove it to nearby Lamar Buffalo Ranch. Attempts by park personnel to reintegrate the calf into its herd were unsuccessful, and, since it posed a safety concern by continually approaching people, it was euthanized. According to the Casper Star-Tribune of Casper, Wyo., Kassam pleaded guilty on June 2. He was sentenced to six months probation and ordered to pay a fine and a $500 contribution to the Yellowstone Park Foundation Wildlife Protection Fund. According to those with decades of experience in the country’s first national park, visitors do best by wildlife if they keep their distance, don’t ever feed the animals, and take photos focused more on the animals and less on their selfies. Many parks, including Yellowstone, require a 25-yard buffer zone for ungulates like deer, elk, and bison and a 100-yard no-go zone for predators like bears and wolves. “Some people just think that’s a suggestion, but the rules are not arbitrary; they are in the best interest of people and resources,” says Yellowstone spokesperson Charissa Reid. The bison put in the car isn’t the first incident this season that has park officials concerned. In recent weeks, there has been a rash of dangerous and illegal behavior—people trying to pose for close-ups with bison or, in one instance, trying to pet an adult bison—some of which has been captured on video and made the rounds on social media. In one incident, four young men visiting the park ventured off the boardwalk at the Great Prismatic Spring—away from the walkways put in place not only to protect visitors from scalding water and sometimes thin geothermal crust, but also to safeguard the delicate bacterial mats which give the spring its stunning colors. No one in the party was injured, but they ended up in hot water with park authorities. Leading the park’s response to record numbers of visitors is Yellowstone’s social scientist, Ryan Atwell. It’s his job to understand what people are hoping to get out of their time in the park and to match that with staff objectives to educate and regulate, to protect park resources, and to safeguard visitors. “We have so many different kinds of visitors with different definitions of what they think ‘wild’ is,” says Atwell. “Some think, ‘I’m in a park, it must be safe’,” he says, but that can lead to plenty of injuries and many more near-misses. So stay on the trail, say the experts, and marvel at how wild the parks can be without human interference. More than 300 million annual park visitors generate a lot of trash, at least 100 million pounds of it. And that’s just the garbage that’s handled by the National Park Service (NPS); it doesn’t include the cast-offs generated by visitors in restaurants, lodges, and tour buses. But from Glacier to Everglades, there are things every park visitor can do to minimize the mess. Roughly a year ago, the nonprofit National Parks Conservation Association (NPCA) and Subaru launched a pilot project in partnership with the NPS. The car manufacturer has operated a “zero-landfill” assembly plant for more than a decade and agreed to lend that expertise to parks. The initiative is now focused on three big parks—Denali, Grand Teton, and Yosemite—where 7 million combined visitors generated 16.6 million pounds of waste in 2013. Nearly 10 million pounds of that was sent to landfills that year, and the rest was reused, recycled, or, where possible, composted. But really helping to reduce the stream of garbage in parks starts before you get there. Mortimer urges visitors to “rethink their picnic” and opt for reusable containers over plastic bags or bottles—including water bottles, coffee cups, dishware, and silverware. Parks are working to increase the number of water-bottle refilling stations, and the water, says Mortimer, is safe. Since food waste is the primary source of garbage in parks, if you’re eating in a park, don’t order more than you need and, if you do, pack containers to take home the leftovers. Two other trash tips to leave parks in better shape than you found them: Choose air dryers instead of paper towels in restrooms; collect micro-trash when you see it (like that tiny corner of the granola bar wrapper that flies away when you’re opening it). “Your choices and behavior are imperative for the sustainability of these places,” says Mortimer. In the early 1990s, an uptick in visitors to parts of Zion National Park turned into 5,000 vehicles vying for 400 parking spaces on a peak season day along the Zion Canyon Scenic Drive. Out of frustration, visitors parked pretty much anywhere, which had a serious impact on some park resources. In 2000, the park put in place the mandatory, and highly successful, shuttle that still operates daily from March through October. Several other parks have followed Zion’s lead, but many more offer voluntary shuttles (including heavily visited Yosemite, Rocky Mountain, Acadia, and Grand Canyon) and other alternative transit. The NPS reports having 147 alternative transportation systems in 72 parks. Congestion on roads means air and noise pollution, parking woes, and traffic headaches. Opting for a shuttle or tram reduces wear and tear on park infrastructure, protects plant and animal life, and creates cleaner and quieter parks for everyone. Not only does getting out from behind the wheel benefit park resources, but it takes the stress out of navigating tricky terrain and allows everyone to take in the sights. And isn’t that the reason we go to national parks? Whether it’s behaving well around wildlife, being mindful of waste, or reducing carbon pollution by swapping your ride, visitors have countless opportunities to leave parks better than they found them. Atwell talks about turning unfortunate incidents into opportunities to educate all visitors and to clarify their roles in the stewardship of nature. 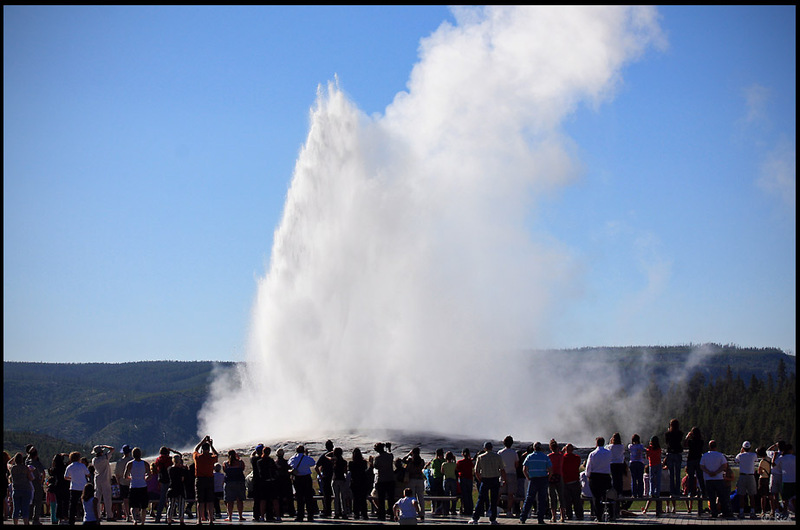 “Some of us are worried that Yellowstone is becoming more of an amusement park atmosphere. But it’s still an amazing, dynamic experience to be in this park. It can be a powerfully positive experience,” he says. Heather J. Hansen wrote this article for YES! Magazine. Heather is an award-winning, independent journalist who writes about science, natural resources, and conservation. She is the author of Prophets and Moguls, Rangers and Rogues, Bison and Bears: 100 Years of the National Park Service.